It will come as no surprise to learn that we’ve all been happily levelling away in SWTOR for the last few days – well, those of us with preorders, anyway. Although we’ll definitely be focusing hard on operations and endgame content when we get there, for now most of us are happy taking our time and enjoying the vast world Bioware has offered us. 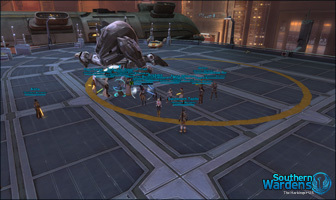 Which meant that tonight, we had plenty of people in the right level range to go pay a visit to SD-0, the Heroic World Boss who hangs out in Coruscant’s Old Galactic Market terrorising unobservant players. …and down he went, leaving us with some shiny Artifact gear mods, a satisfied feeling, and that good old raiding buzz. Thanks to all who came along, to Maximonious for prompting the adventure, and to Kristakis for frapsing the whole affair. Some clown invited me to do this when I was lvl11 with about 3 others. I thought I would participate just for the lol’s. I was the last man standing…. :) Grats to all, wish I could have come.